A new survey shows new residents and longtime residents in Seattle and its suburbs think differently about the region and its growth over the past few years. But there are a few things we have in common. Thank God for the 12th Man. Because, if a new survey is to be believed, a shared love of the Seahawks is one of the few things holding this city together. OK, that’s an exaggeration. But what the survey reveals is that, other than the Hawks, there’s not a whole lot that old-time Seattleites and our area’s throngs of young newcomers can agree on. The Northwest-based public-relations firm Quinn Thomas teamed up with polling outfit DHM Research and the University of Washington Continuum College to conduct this survey of 800 King County residents from May 31 to June 12. Half the respondents have lived in the county for a minimum of 15 years, and are defined as long-term residents. The other half are the newcomers, meaning they’ve been here fewer than five years, and are probably still going around saying “Pike’s Market” and mispronouncing Puyallup. The survey’s two samples reflect the reality that the largest group of newcomers are millennials, while long-term residents tend to be significantly older. Of the survey’s new residents, 59 percent are between the ages of 18 and 34. Just 10 percent of the long-term residents are that young. 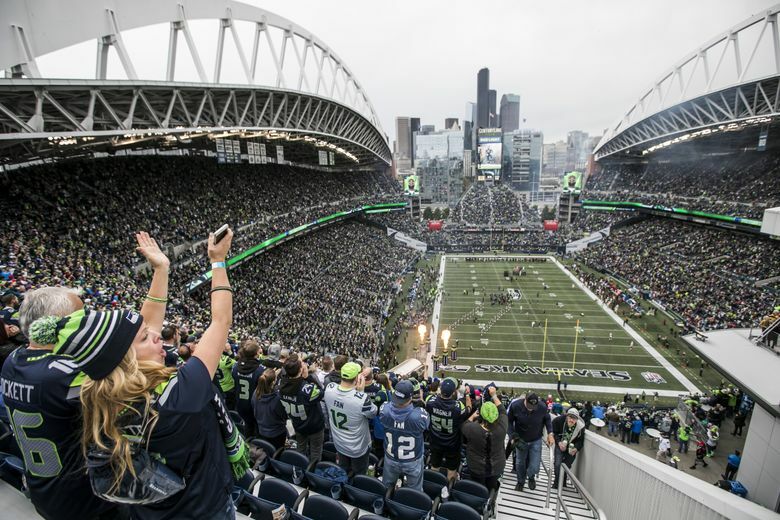 The data show that football bonds old and young Seattle, with just under 50 percent of each group citing the Hawks as their favorite local team. Even so, there are some differences within the world of Seattle sports, with newcomers more likely to favor the Sounders and a higher percentage of old-timers likely to be die-hard Mariners fans. Another area of convergence: When asked what they most value about living in the Seattle area, the No. 1 response from both groups is the region’s natural beauty. But newcomers are a lot less keen on the constant rain — only 5 percent chose the weather as their favorite feature of Seattle. For long-term residents, that was the No. 2 response, picked by 12?percent. One finding of the study that I found a little surprising: The (slight) majority of long-term residents believe our region’s tremendous growth is a good thing, with 52 percent agreeing that it creates economic opportunities for everyone. As expected, newcomers are much more pro-growth, with 73?percent in favor. But the two groups have very different feelings about the direction Seattle is moving in. Newcomers, in the short time that they’ve been here, see Seattle on an upward trajectory. Fifty-nine percent said the area has become a better place since they got here, and 65 percent said Seattle is headed in the right direction. Compare that with folks who’ve been here at least 15?years. Just 41 percent think Seattle has become a better place to live, and 43?percent think things are moving in the right direction. The top two concerns that long-term residents point to as the reasons for their discontent: too much traffic and too many people. 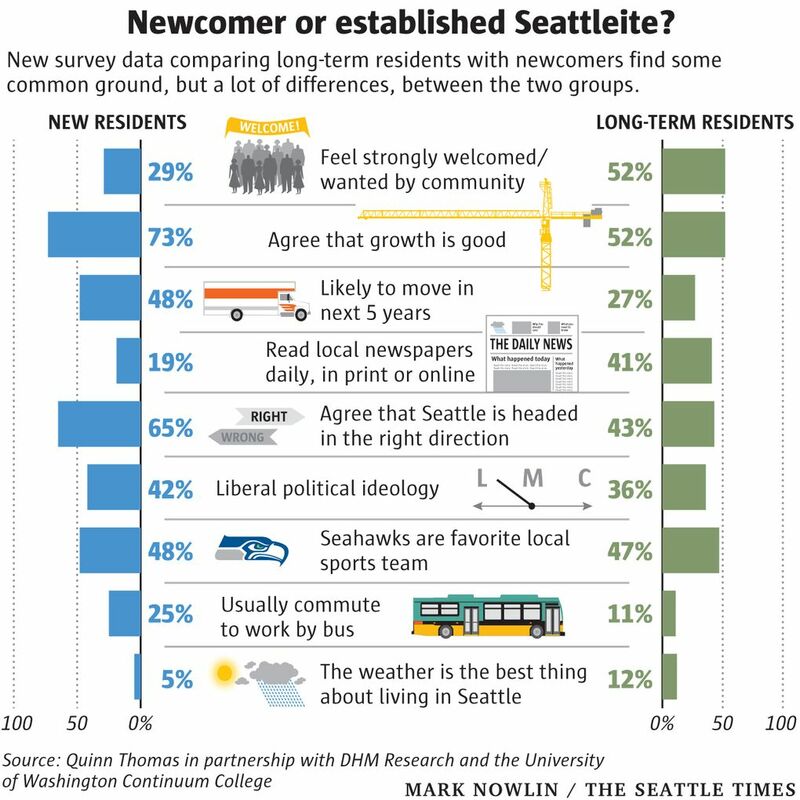 But before you conclude that the newcomers are much more stoked about Seattle, consider this unsettling finding: Just 29 percent of those who’ve been here less than five years said that they feel strongly welcome and wanted by the community. Could it be the Seattle Freeze rearing its ugly head? Among long-term residents, 52 percent responded positively to the question about feeling welcome and wanted. And people who’ve lived here a long time are also significantly more likely to say that people in the community share their values. Housing is a big source of frustration for everyone in Seattle, not just newcomers who feel like they’ll never be able to own a home in this hypercompetitive market. Even though many long-term residents already own a home, the issue can still affect them. Take Rita, a 60-year resident who participated in the survey. For both newcomers and long-term residents, 64?percent identified housing as a reason someone might leave this area. Nearly half the new folks said they’re likely to move within the next five years, which can probably be attributed to their youth as much as to the high cost of housing here. Among long-term residents, who tend to be older and more rooted, only 29 percent anticipate a move in the next five years. King County has long been a pretty liberal place, so it’s not a surprise that newbies and long-term residents have similar political ideologies. Just about 20?percent for each group identify as conservative. But newcomers are more likely to consider themselves liberal, 42 percent to 36 percent. But maybe not so open-minded to conservatives, said Rebecca, a Woodinville resident of 20 years. “If you have an idea that is different than the mindset of most people in any kind of conversation, it feels squashed,” she said. The margin of error for a sample of 400 residents is ±4.9 percentage points. There were multiple contact methods to ensure a representative sample, including live telephone interviews and online surveys. Efforts were made to ensure diversity by age, gender, race, income and occupation.